The Dublin government has been accused of attempting to erase the 1916 Easter Rising from the history books following a disastrous and deeply conflicted launch of commemorative events for the anniversary. A group representing relatives of those who took part in the Rising boycotted the launch. The 1916 Relatives Association dismissed an event this week at the GPO, the headquarters of the Easter Rising, as “stunt politics”. The 850-strong group said they have no confidence in Arts Minister Heather Humphreys after the events outlined this week differed sharply from what a senior official from Humphrey’s department had told them. Una McNulty, a spokesperson for the association, said that its members felt like they had only been invited to the event “merely to act as pawns in a political stunt that wants us there simply as a photo opportunity”. Other key relatives were not even invited to the launch, and plan to announce an alternative set of events centred around the GPO and the last surviving buildings used by the rebels in Moore Street. As part of the government’s plans, seven projects will be funded by next Easter to create “permanent reminders” of the 100-year anniversary. James Connolly Heron, great-grandson of rebel leader James Connolly, said the preservation of Moore Street, the second major site of the Rising, should be a flagship project. “There’s nothing concrete. It’s not honouring the lives of the men and women. It’s not portraying them as the cultural figures they were as part of a renaissance,” he said. As part of alternative commemorations, relatives of the rebel leaders and volunteers plan to put up a plaque, develop a historical cultural quarter, create signage for important landmarks, hold a series of education and cultural events but with the focus around the importance of the near-derelict Moore Street site at the rear of the GPO. A spokesperson for Minister Humphreys, however, claimed that some relatives were at the official launch event, and that they were “very supportive” of the government’s plans. Speaking at the launch of ‘Ireland 2016’, the state’s official programme for the anniversary, Humphreys herself said that the series of events were designed to “remember, honour, inspire and motivate”. At the launch, Taoiseach Enda Kenny stated that 2016 “presents us with a once-in-a-century opportunity to create events of celebration and remembrance that are of value in themselves but that also contribute to a greater sense of who we are, what we want to be as a people, what achievements we aspire to for ourselves and for our children”. His speech was interrupted by an anti-austerity protester. “What did you sacrifice”, she demanded repeatedly of the Taoiseach, before being bundled away. 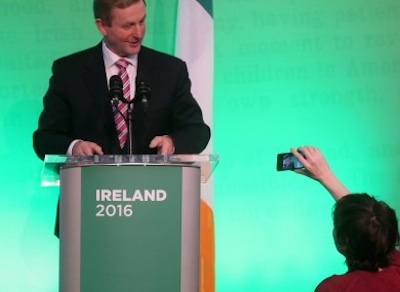 An official video for ‘Ireland 2016’ embarrassingly fails to refer to the 1916 Rising at all. The 80 second promotional video - titled Ireland Inspires 2016 - was published to coincide with the launch of the centenary programme. The controversial video ignores 1916 and instead features images the queen of England, multinational corporations and the tourism industry. Set to an upbeat musical track and accompanied by the motto ‘Ireland Inspires’, it highlights figures such as Ian Paisley, Queen Elizabeth, Bono, David Cameron and Bob Geldof but at no point are Padraig Mac Piarais, James Connolly or indeed any of the other executed 1916 leaders mentioned in the piece. Publication of the video last night with a hugely negative reaction. No information has been released so far on the potential involvement in the commemorative events of the English queen or other members of her family, which had been signalled earlier in the year. Political commentators have pointed out that Fine Gael, the most conservative and pro-British party in the 26 Counties, has always been deeply uncomfortable with the radical and revolutionary nature of the Easter Rising. The coalition government is also fearful that any emphasis on national historical events could boost support for rival candidates, such as Sinn Fein, ahead of the next general election, due in 2016. Meanwhile, Dublin officials confirmed that Google Translate was used to translate English into Irish on the new government website promoting the commemorations, including an excerpt from the 1916 Proclamation. Conradh na Gaeilge, the Irish language support organisation, said the result was nonsensical gibberish. It condemned the humiliation, as well as the lack of Irish on the website throughout the 1916 programme. Sinn Fein spokesperson for Arts and Heritage, Sandra McLellan TD, has urged the public to tell the government how they wish to commemorate and celebrate the 100th anniversary. “What the Government have announced this week at the GPO is a lightweight commemorative programme which fails to reflect the importance of the 100th anniversary of the 1916 Rising in a fitting or meaningful way politically, culturally or socially,” she said. “The Government have paid lip service to the All-Party Oireachtas Committee on Commemorations since its inception and basically ignored the relatives of both the 1916 leaders and those many rank and file volunteers who gave their service, and in many cases their lives for a Republic, yet to be realised. “Any state programme must be inclusive of the entire island and the Irish nation as a whole, including the diaspora. It must aim to educate, motivate and celebrate around the very ideals and vision as espoused in the proclamation rather than become a military and ceremonial event without substance. “Organisations that were centrally involved in the 1916 Rising such as Conradh na Gaeilge, the GAA and Trade Unions must be included in any official state commemorative programme. “The government has not committed to a major sculpture or piece of art to commemorate the 100 year anniversary. For an event of such historical significance this must be rectified. “Citizens and communities must be actively encouraged and facilitated in an open way by the Government to generate and put forward their views and ideas on how we commemorate this critical period in our country’s history. “Sinn Fein fully supports the 1916 relatives association and the ongoing battle to save Moore Street led by the descendants of the signatories of the 1916 proclamation.